Facebook has now set a limit on sending friend request to their users so now if you are thinking that you can make thousands of friends using your Facebook profile then let me inform you that this may cause profile block. According to Facebook they have put such restriction for “back-end” technical reasons. 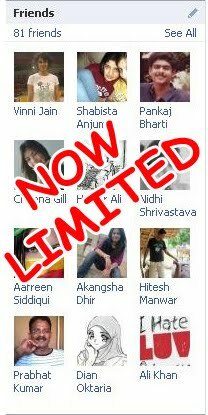 If you’re in Facebook only to promote your business by adding thousands of friends in your profile, then from now you’ll shocked to know that adding friends in Facebook profile is now limited. Facebook has made a limit of 5000 friends in one person profile. Site has put restriction upon user profile, though you still can create groups or fan pages (most famous to promote your business). Those who are in just because of their friends, family, girlfriends , etc thinks why people want to add thousands of friend under their profile, what about privacy then? Then let me clear you they doesn’t need any privacy or any social contacts, they are in just too popular their business, they are to promote their business In front of thousands. According to spokeswoman Meredith Chin, of facebook, only “a fraction of a percent” of the site’s 400 million global users has topped the limit, making the few that do have 5,000 pals a new, albeit strange, and sort of elite. Make friends but in limit, enjoy using facebook.